"He's clean. He's mean. He's the go-between." 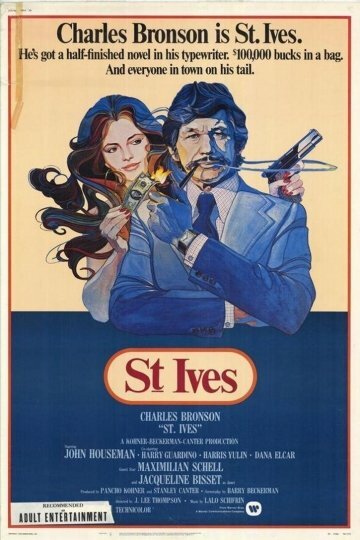 Action star Charles Bronson is an ex-crime reporter-turned- author, who takes a job as a go-between to help recover some stolen ledgers and instead becomes involved in a scheme to steal a bribe that some American businessmen are paying to Arabs. Featuring an all-star supporting cast, including John Houseman, Jacqueline Bisset, Maximillian Schell, Harry Guardino, Michael Lerner and Daniel J. Travanti. St. Ives is currently available to watch and stream, buy on demand at Amazon, Vudu, FandangoNow, iTunes, YouTube VOD online.